I recently had the pleasure of speaking with Kendrick of Art Nouveau Magazine about the evolution of my Vectorfunk illustration style. Art Nouveau is a great online magazine that focuses on everything from art/design to fashion to music. Also featured in this issue: Saul Williams, Chris Jordan, Ryan Casey, Plain Gravy, and more. 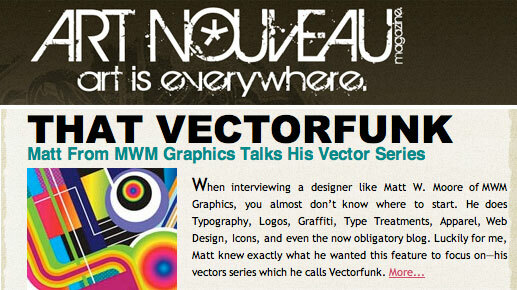 MWM Art Nouveau Interview.